The clinical results show that burn ointment has anti-inflammation, anti-bacterial, accelerating effects to speed up burn restoration and it is anti-scar. The presence of fatty acids in the sesame seed oil combining with the bees wax along with the effects of Alkanine and flavonoids existing in the herbal extract, increase blood supply and stem cell proliferation of the skin and speed up restoration of the damaged tissue which causes new formed dermal and expedite its natural elasticity. In addition, the effect of antibacterial and strengthening effects of the immune system, will affect to increase the blood flow at the burn area, beeswax creates an appropriate environment for the growth of the tissue, which directly interferes with wound healing. 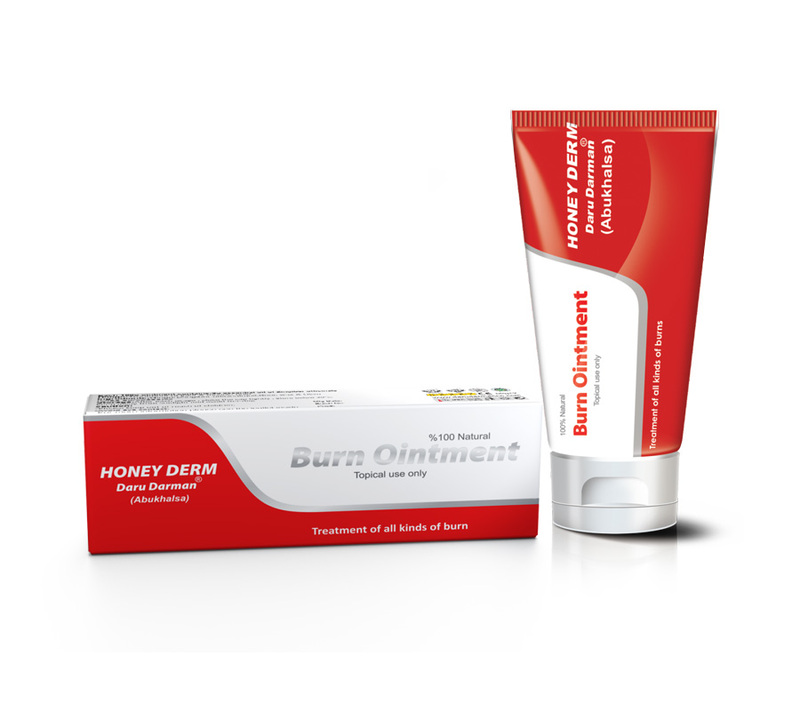 Unlike most of the drugs which nowadays are used in treatment of burn and through suppression of the immune system it control the inflammation, Burn ointment controls the inflammation without inflicting side effects and as a result it increases the speed and quality of the burn restoration. Stop immediately if there be any rash/allergy development. Always test ointment on a small skin area before applying on the affected area for irritation/rash/allergy. Seek doctor advice if irritation/rash/allergy occurs. Secretions from the wound during treatment with the ointment are a sign of healing process and infection discharge is not a concern. Application during pregnancy and lactation periods is permitted. All ointments may have unwanted side effects. Although all these side effects are not likely to be seen in every one, you must consult with physician or pharmacist in case of any allergies or irritations arise. Possible side effect of this ointment is exanthema (topical small rashes) on the body, which must be consulted with physician if observed. In grade 1 burn, it affects only the outer layer of the skin, i.e. epidermis and some degrees of redness and inflammation is observed on the skin. Rinse the affected area with normal saline serum. Use burn pad or burn ointment for wound dressing once in every 12 hours, repeat this process until wound is completely healed. This type of burn heals between 3 to 5 days on an average. In grade 2 burns which inflicts the epidermis and some part of dermal, possibly blister is seen. Separate the blister from the affected area and rinse the affected area with normal saline serum. Apply 2 or 3 millimeter ointment on the special material and apply it on the affected area. Preferably to use burn pad on this wound dressing. In this type of burn, never apply the ointment directly on the affected area. If there is no blister on the affected area, the wound should be treated similar to grade 1 burn. In grade 2 burn, require wound dressing to be changed every 24 hours. If infection observed in the affected area, then the treatment must be done in every 12 hours. An average duration treatment for this type of burn is between 10 to 15 days. In the grade 3 burn, it involves all skin thickness i.e. epidermis and dermal are damaged, the damage may even extend to the under skin tissues, similar to grade 2 burn, act on treatment and change the wound dressing once in every 24 hours until the infection is healed completely and the damaged tissues are restored. An average duration treatment for this type of burn is between 20 to 35 days. Continue this process till the skin restores its own natural color and condition. Apply the ointment on the skin daily for one month. Daily bathing with baby shampoo and soft washcloth is recommended for grades 1 and 2 burns. In the grade 3 burn, seven days after the first wound dressing with burn ointment is accomplished, bathing is allowed, repeat once in every two days. Experiencing irritation on the burnt affected area for about 5 to 10 minutes after applying the ointment is normal, which indicates the effectiveness of the ointment. By applying slight pressure with warm soft washcloth around/on the severe pain affected area will help to reduce the pain and accelerates the healing process. Consuming correct nutrition which includes protein, carbohydrate and fat existing in the diet are of crucial priorities to the burn patients’ coupling with treatment. In grade 2 and 3 burns, treatment under supervision of wound expert is recommended. Keep away from sunlight and avoid freezing.